The image above shows my solar electricity generation and usage in 2017 by calendar month. The purple line shows the use of electricity (excluding gas replacement) by month. It’s relatively stable through the year, although it does rise in the autumn as my daughter started school and so my electric car mileage increased. The green line shows the output from the solar panels. From April to August (5 months) solar panel output exceeded usage giving the potential not to buy electricity with sufficient smart capability – be that electricity storage or alignment of consumption with availability. The red line shows import of electricity from the mains. It tends to be the reverse of the solar panel output. It’s never zero indicating potential (at cost) to improve smart usage. 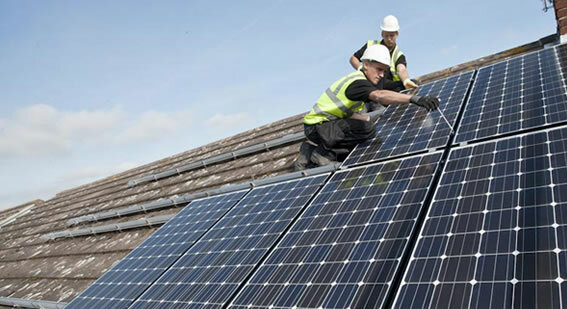 Solar power is a more significant energy source than imported power from March to September (7 months). The blue line shows diversion of surplus electricity to water heating as gas replacement. The turquoise line shows export of electricity to the grid. This occurs when there is insufficient energy smart resource available to store or self-use the surplus power. Export amounts to about 12% of total solar panel output. While this potentially free energy, the economics of storage or smart controls make using this remainder increasingly costly from an investment perspective. In my case this surplus occurs on particularly sunny summer days when the electric car is not at home or is already fully charged – which might be vacation periods when the house is unoccupied for example. This entry was posted in Energy Smart, Solar PV on 01/01/2018 by Greening Me. 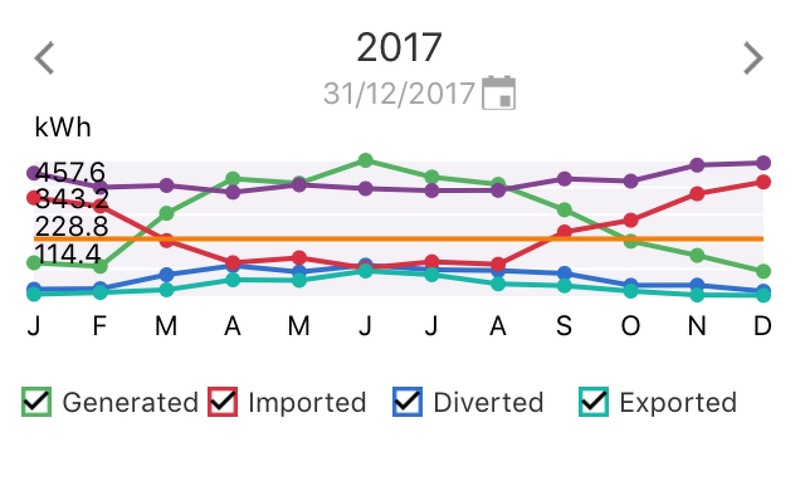 The end of 2017 sees 2 full calendar years of output completed (plus a few months at the end of the prior year) so it seemed like a good time to assess performance and return. 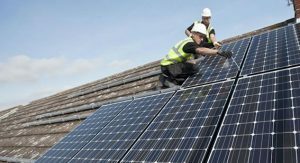 Return comprises two parts – firstly the payments received for electricity generation (and export) the so-called feed-in tariff or FiT and secondly the savings obtained from using that free energy myself instead of buying it from the grid. In my case I can use and store my solar electricity directly, or use it to heat water via the immersion heater thus replacing gas. Output from the panels was slightly reduced in 2017 versus 2016, but still significantly above the performance projected in the quotation. I put the slight reduction down to year-to-year differences in the weather. Over time I would expect panel output to decline, but I think it’s too soon to attribute any decline to this. Income from FIT was slightly higher as inflation on the price / kWh has overcome the slight output reduction. Electricity self-use is up considerably from 41% to 64% due to my 4 kWh storage battery. The costs of that battery are not reflected in the table. Return would have been 8.8% in 2017 (rather than 15.1%) if the cost of the battery was included. Gas replacement is down from 27 to 23% versus 2016 as more of the electricity from the panels is used for high value activities like charging the storage battery or my electric car, and less is left over for water heating. The low price of gas per kWh makes gas replacement my lowest priority for self-use. Exported electricity (i.e. what’s left-over that I cannot use myself) is considerably reduced from 32 to 12% largely as a result of increased electricity self-use. Financial return in calendar year 2017 is improved from 13.6 to 15.1% neglecting the costs of the battery, or reduced from 15.1 to 8.8% taking into account capital costs of the battery. It will take approximately 7 years (i.e. 2 past + 5 future years) for the combination of the solar panels and battery storage to pay for the solar panels (neglecting the battery costs), and a further 2 years of system savings to pay for the storage battery. This entry was posted in Electricity storage, Solar PV, Water heating on 01/01/2018 by Greening Me.